The best way to describe Drill Sergeant Mindstrong would be to liken it to a military boot camp version of Brain Training. 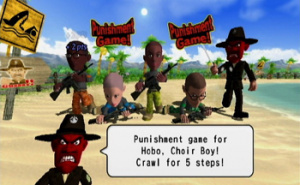 The game presents you with four basic mini-games, each with its own unique military theme complete with a Drill Sergeant barking commands and insults at you on a nearly continuous basis. While these mini-games are enjoyable enough, the mere fact that there's only four of them means that they tend to become repetitive rather quickly. Couple that with an overly basic game play system and you have a WiiWare experience that loses its luster far too quickly and ultimately comes off feeling like more of a chore than an enjoyable gameplay experience. When you begin the game you're given a choice of a character to use. Once you come in first place at the end of a game, you'll be given access to your Mii characters. You'll then be given a nickname ranging from stringbean to lice. You'll also begin the game at the Maggot difficulty and have to work your way up to harder difficulties. 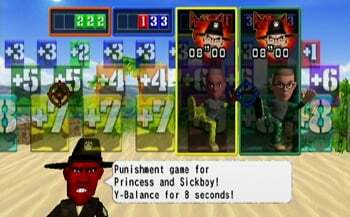 You can have up to four players compete against each other, with any unused player controlled by the CPU, and you can even vary the difficulty of the CPU-controlled players if you're finding the competition a bit too easy or difficult. The Drill Sergeant will explain the order of the four different competitions and then the game begins: winning each game is a simple matter of having the most points when the game finishes. Hell Roll Call is likened to a military version of Simon Says. The drill sergeant will bark out commands and you'll have to follow along. These include commands such as attention, at ease, arms forward, and salute. For this competition you hold the Wii Remote in your hand and then perform the various instructions as you would in real life. When you're asked to salute, you'll bring the Wii Remote up to your head in a saluting motion, and the same goes for the other commands. The faster you respond, the more points you'll be awarded. Likewise, there will be times when you'll have to say "Yes Sir" to the sergeant by pressing the "A" button on the Wii Remote. The Drill Sergeant will mix up the commands to keep you on your toes, so you have to pay close attention. If you begin making too many mistakes, you'll be punished and required to do push ups by moving the Wii Remote in an up and down motion. Hell March is basically what it sounds like. You hold the Wii Remote in your hand and then swing it back and forth in a marching motion to the rhythm that's currently playing in the background. The pace will change several times during the competition, so you'll have to change your swinging rhythm to match it. The Drill Sergeant will also ask you a series of YES/NO questions that you'll have to answer as you march along. You press the "A" button for YES and the "B" button for NO. You're awarded points for keeping in rhythm with the marching and also for answering questions correctly. Just like the other competitions, if you begin making too many mistakes, you'll be punished by being forced to crawl along the ground. During this time you will be unable to take part in the question/answer session and lose valuable marching points as well. Hell Shooting is the first of two shooting challenges in the game. In Hell Shooting you will be presented with four rows of targets, each containing nine colored targets with numbers imprinted on them. You move your targeting reticle around by pointing the Wii Remote at the screen. The Drill Sergeant will bark out various commands as to which targets to shoot and you'll have to shoot as many instructed targets as possible in the short amount of time you're given. You have limited ammo, so at times you'll be forced to shake the Wii Remote in order to reload. Sometimes you'll have to shoot certain rows of targets, and other time you'll have to take out specific colored or numbered targets. 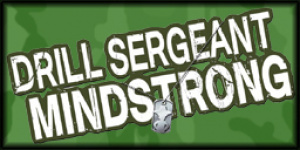 The Drill Sergeant will keep mixing it up to keep it challenging for you and the other players. Hell Calculation is the second shooting competition and adds a bit more variety to the mix. 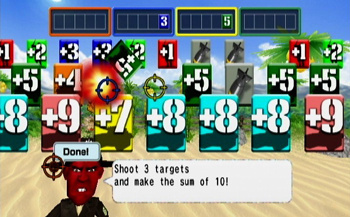 While you'll still be taking out targets using your Wii Remote targeting reticle, this time you'll be given specific numbers of targets and a specific sum to come up with. This is generally in the form of "Shoot three targets that equal the sum of twelve" at which time you'll have to follow suit. You shoot the desired targets and then point at the Drill Sergeant at which time he'll award you points if you come up with the correct sum. He'll also deduct points if you use the incorrect combination of numbers. To make it a bit more interesting, you'll also have certain missile targets that you must avoid shooting or it will blow up all of the targets you've already shot down and you'll have to start over. Once you've completed all four competitions, your totals are tallied up and the winner is crowned. You'll win various medals and other goodies as you rack up more and more points in the competitions. You'll also unlock harder difficulty settings to make the game even more challenging. While the play control itself is fairly solid, the entire premise is almost too simplistic in design and makes the challenges become redundant far too quickly. Even after your first trip through the four challenges, you'll find yourself already losing interest in the experience. And while it's fun to go back and try to beat your best scores, it won't take you long to realize that it's more trouble than it's worth given the redundant nature of the gameplay. It's nice that you can go back and practise the individual competitions if you're having trouble or don't feel like going through the entire game to reach a particular favorite, but since they're still basically the same challenges you've already played, they're really of little use. Having other real players to take on does add a bit of competitive spirit to the experience, but even then it's not enough to make you want to spend more than half an hour with the game at most. The visuals in Drill Sergeant Mindstrong are adequate for the setting, but they show very little polish and can be a bit dull at times. The between-level instruction screens are very smooth and well-drawn, but the areas in each competition look extremely jagged and the animations of the various characters are a bit on the choppy side. Even the hilarious red-faced Drill Sergeant with the steam coming out of his head and nose isn't enough to make up for it. The whole presentation just seems a bit thrown-together at times, especially when compared to some of the more impressive WiiWare visual experiences we've seen on the service. Much like the visuals, the audio presentation isn't overly impressive. Not only does the music become a bit grating, even in the early stages of the game, but it doesn't seem to fit in very well with the military theme the game employs. 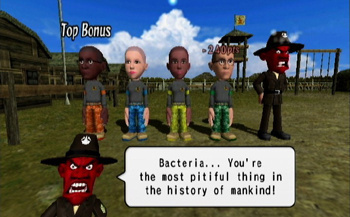 The game uses this corny gibberish that forces you to constantly read the text bubble coming out of the Drill Sergeant's mouth in order to know what he's saying to you: what fun is it to have a Drill Sergeant barking orders and insults at you if you can't even understand what he's saying? It's not only distracting, but it loses some of its forcefulness when you have look over to read it instead of hearing it screamed out at you. Drill Sergeant Mindstrong features quite a few interesting gameplay ideas, but they ultimately become too weighted down with the overly simplistic play control and mediocre audio/visual presentation to be of much enjoyment. If you can track down some friends or family members to play the game with, it at least adds some competitive fire to the experience, but you'll still likely tire of the game long before you get your money's worth out of it. Unless you're just a serious mini-game junkie that can tolerate the repetitive nature of the game's challenges, you're likely going to find this WiiWare experience very average and uninspiring. Well, this is rather surprising. I was expecting it to fair even worse than this. Well, it managed to surpass my expectations, at least. He wasn't sure whether to give it a 3 or a 7. In the end he just averaged them and posted that. I didn't have very high expectations for this one so I can't say I'm surprised by the score. Nice review anyway Corbie! How's the Conduit? Everything you hoped for? Hmmmm, never mind. I'll stick to the DS brain games.. Didn't expect too much from it, especially after seeing the gameplay features in the manual. At least it got an Average score. @Corbie: I wish I could say, but I leave for the beach Friday and refuse to start a game and then drop it for over a week and forget everything about it. Also, when is that BOXLIFE review? I didn't think anything about it, but from things I hear about it on other sites, it's a must-have, best Art Style yet, and up there with MFC and MvDK. So naturally that perked my interest. More like Drill Sergeant WEAKSAUCE, amirite folks!?! Called it! In some thread somewhere. Bah can't find it. Whatev. Corbie's getting predictable! If you don't buy 10000000 copies of this game then you can forget about XSEED giving us Drill Sergeant 2! Listen to Dazza people, we can't let that happen! Corbie, yoor score is 2 points off. Best ArtStyle game? I think Cubello and AQUIA have something to say about that. Sounds like it only deserves about a 3 or a 4. Definitely going to disregard this one.